Looking for a fun, festive dessert? You’ve come to the right place! These Springtime Dessert Pots are the perfect way to celebrate the arrival of Spring. They’re easy to put together, delicious to eat, and couldn’t be any cuter! 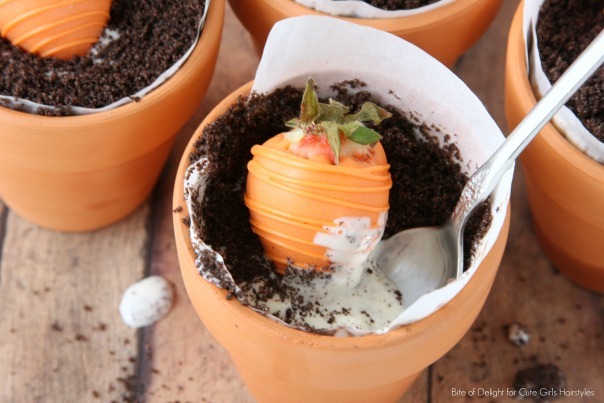 Using real terra cotta flower pots is a unique way to serve dessert for family night, or for company. These are always a big hit, especially with the kids! 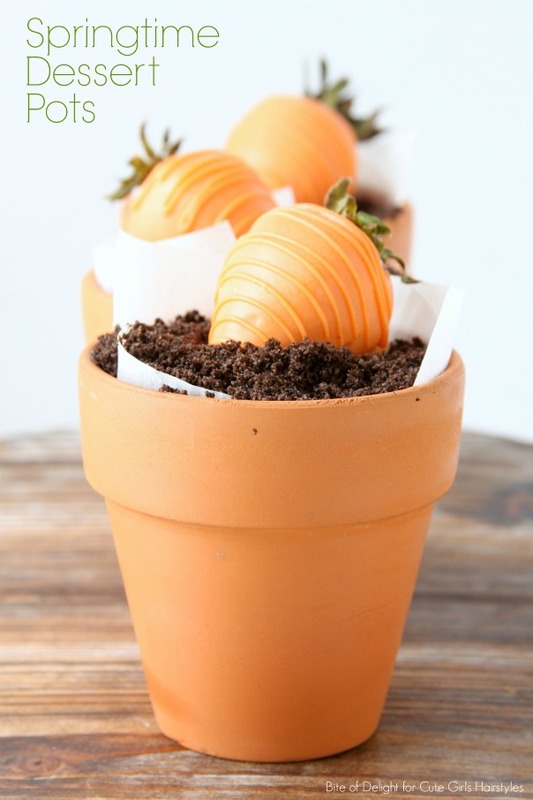 Dipping strawberries in the orange candy melts is such a great way to make a “carrot” for your little garden pot. 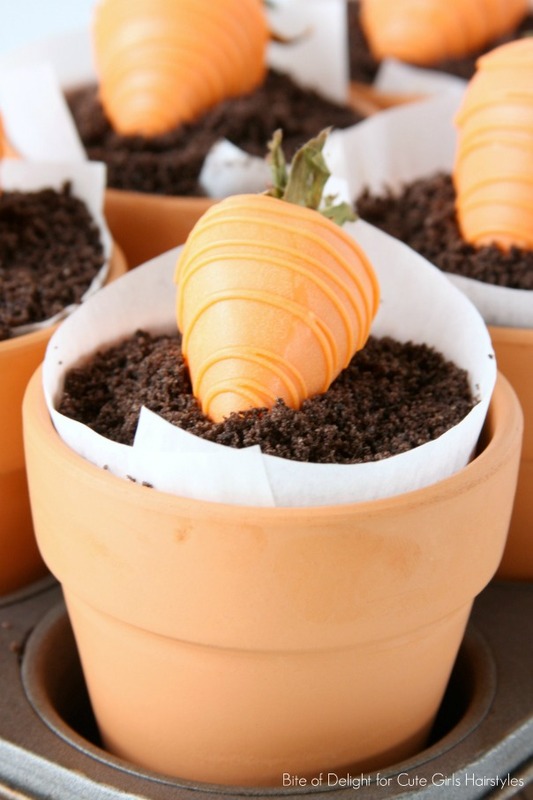 Just wash, dry, dip & drizzle and you have yourself the cutest little “veggie” to top your dessert pots! If you haven’t dipped strawberries before, check out my tips for perfect chocolate covered strawberries. It’s easy, but there are some important things to know! This recipe uses a boxed cake mix, which really makes it simple to put together. I used German Chocolate, but you can use your favorite variety. We love Devil’s Food! The consistency of the baked cake is somewhere between a brownie a slice of cake…so we call it brownie cake! I like to use a muffin tin to hold the pots as they bake because it makes it so easy to get them in and out of the oven. And feel free to trim the parchment paper down to the top of the pot if you don’t want it showing. Sometimes I do and sometimes I don’t…I think it’s cute both ways! Wash and thoroughly dry terra cotta pots. Line each pot with parchment paper. Cut a round piece for the bottom (about 1 1/2 inches in diameter) and two strips for the sides (3×5 inches each). Set aside. In a medium mixing bowl, combine the cake mix, eggs, butter and chocolate chips. Mixture should be thick. 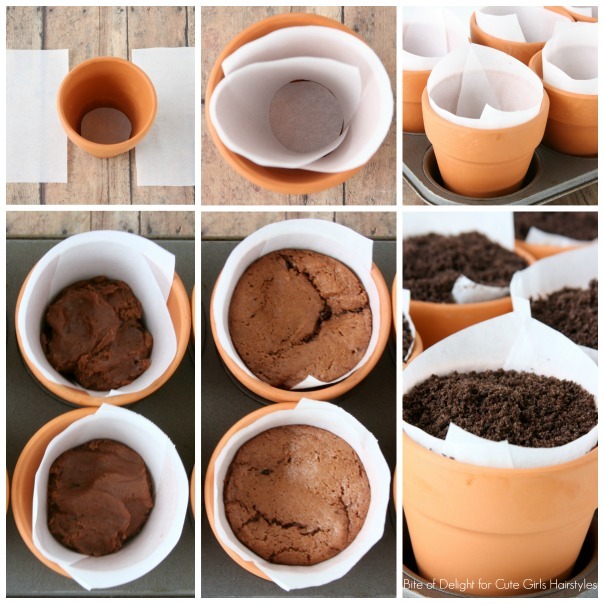 Place parchment liners in pots. Scoop 4 tablespoons (or 1/4 cup) of brownie cake mixture into each pot. Place terra cotta pots in a muffin tin and bake for 35-40 minutes, or until cooked through. We like ours a little gooey, so I take them out around 35 minutes. While the brownie cakes are baking, wash and thoroughly dry the strawberries. 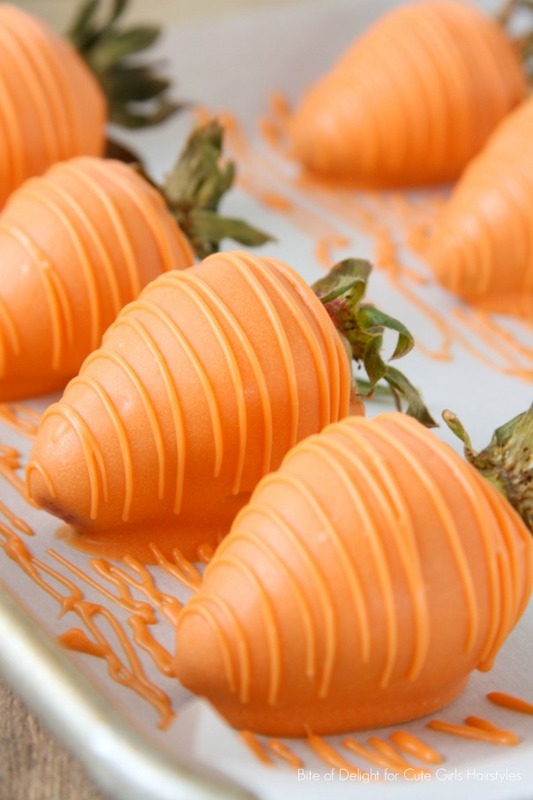 Dip strawberries in the orange melts and place on a sheet of parchment paper to harden. Drizzle with leftover melted orange to add carrot detail (spoon into a sandwich bag, make a tiny snip in one corner and squeeze). When the brownie cakes have cooled slightly (or completely), top with softened ice cream and smooth with the back of a spoon. Sprinkle liberally with crushed Oreo cookies (it really looks like potting soil! ), top with a strawberry “carrot” and serve! After researching it, I still wasn’t sure if all unglazed terra cotta pots were food safe. There was a lot of conflicting information, so I decided to play it safe and line them with parchment (which also made clean up easier). I grabbed the pots at my local garden center. I’ve also seen them at craft stores. To easily make the parchment rounds, I place a pot on a piece of parchment paper and trace the bottom. Then I cut it out just inside the circle I drew (since the inside of the pot is smaller than the outside). It doesn’t have to be perfect…none of mine ever are! Using a muffin tin to hold the pots is just for convenience in getting them in and out of the oven. You may place the pots directly on the oven rack to bake. You can crush the oreos in a zip top bag using a rolling pin, or use a food processor. I’ve tried using cupcake liners, but they stick to the brownie cakes. The parchment paper doesn’t stick. You can use liners, but be aware that it may be a little harder to eat because it will stick. I have made this dessert using different sizes of box cake mixes. They range from 15.25 oz to 18.25 oz, and I’ve had success with all of them.